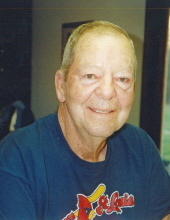 Carl “Toby” Green, age 82, of Stanton, Missouri, passed away on Saturday, April 13, 2019 at his home, surrounded by family. Carl Edward Green, known as Toby to family and friends, was born on October 31, 1936 in St. Louis, Missouri, the son of Samuel J. Green and Delia Tucker. He was a jokester with a great sense of humor. On November 28, 1953, Toby was united in marriage to Janet Woodcock in Sullivan, MO. They were blessed with two daughters, Teresa and Tammy. Toby worked for the maintenance department at Kroger Grocery, and then National Food Stores. from which he retired. He then went to work for the City of St. Clair Street & Water Department, doing general construction work. He finally fully retired from there in 2006. Toby loved woodcutting, being outdoors, hunting & fishing. He was a friend to many and was always ready and willing to lend a helping hand. Toby shared special relationships with his nieces and nephews and always helped his family whenever they were in need of a hand or just some advice. He will be lovingly remembered and missed by his family and friends. Toby is survived by his wife of sixty-five years, Janet A. (Woodcock) Green of Stanton, MO; one daughter, Teresa Record and husband, Bill, of Stanton, MO; 3 grandchildren: Billy Record and wife, Brandi, of Sullivan, MO, Ryan Record and wife, Nicki, of Sullivan, MO, and Shannon Bacon and husband, Steve, of Arvada, CO; seven great-grandchildren: Samantha, Brianna, Abby, Will, Allison, Lilah, Luella, and one on the way, Delaney; other relatives and many friends. He was preceded in death by one daughter, Tammy Kirk; five brothers; five sisters; and sister-in-law, Betty Green. All arrangements are under the care of the Eaton Funeral Home of Sullivan & Bourbon, MO. To send flowers or a remembrance gift to the family of Carl "Toby" Green, please visit our Tribute Store. "Email Address" would like to share the life celebration of Carl "Toby" Green. Click on the "link" to go to share a favorite memory or leave a condolence message for the family.